Traffic constable Subedar Arun Singh in Indore, Madhya Pradesh, on Wednesday. A video of the incident had gone viral on Tuesday in which the policeman can be heard saying that he will not get frightened by any threats in the line of duty. The cop, who calls himself “Subedar Arun Singh” in the video, says he tried to stop the men because the driver of the vehicle was talking on the phone. “They say there is Congress rule here and I have to do as they say. I am Subedar Arun Singh, Traffic Police, West. I will not listen to anyone. 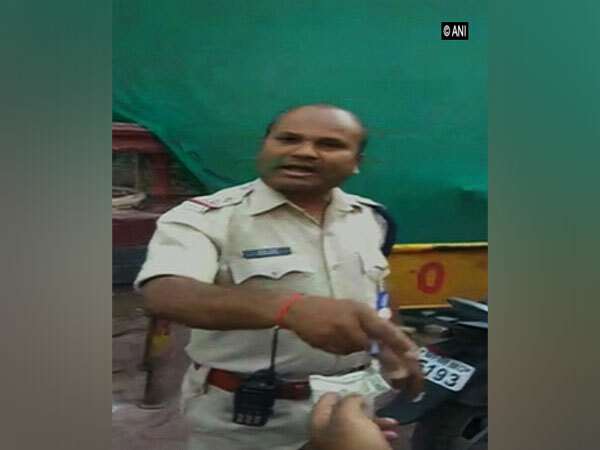 I will certainly make a challan and collect fine from those found breaking traffic rules even if you threaten me in the name of Bala Bachchan or someone else,” says the cop in the video. However, Indore's Super Superintendent of Police Ruchivardhan Mishra said the behaviour of the constable was prima facie not good. "According to police working on the ground, his behaviour prima facie is not good. Getting into a spat with the commuters was an overreaction on his part. We have decided that such policemen be sent to a stress management camp where they will do yoga and other activities to relieve stress. He will receive training to understand the behavioural aspects of working on the field," she said. Even after he was sent for the stress management training course, Congress submitted a memorandum to SSP Mishra and asked her to take action against Singh in the matter. The party asked for a departmental enquiry under ITI Act against him for "indiscipline and immoral behaviour". They claimed that neither Bala Bachchan called Singh nor was he pressurised in any way.